Amid fiscal hurdles, Bacow — an economist by training — is examining the University’s financials at the macro level. He’s already looking ahead to when the next recession hits. 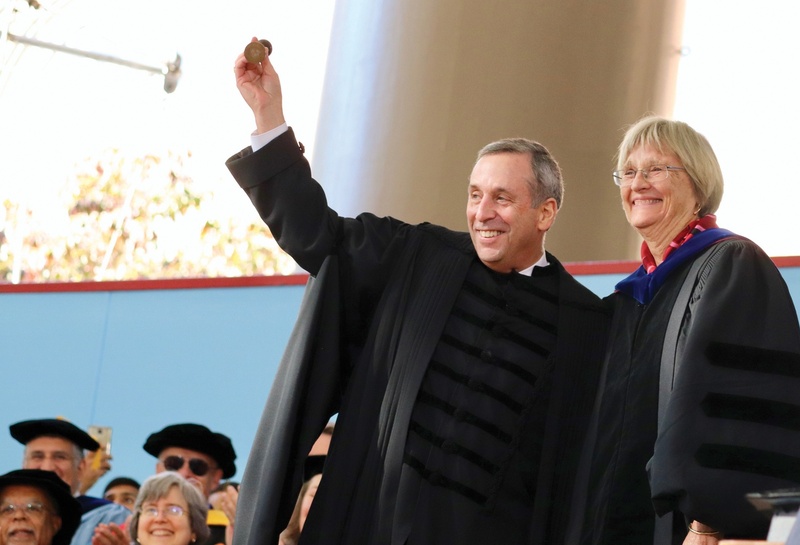 University President Lawrence S. Bacow and former University President Drew G. Faust at Bacow's inauguration in October. Before University President Lawrence S. Bacow rose to the helm of the nation’s oldest university, he was an economist. Judging from his plans for Harvard's future, he still is. Bacow's economics expertise has come into play as he navigates new financial challenges in the first months of his presidential tenure — including an endowment whose returns continues to lag behind those of Harvard's peers and an unprecedented endowment tax levied by Republican lawmakers in December 2017. Bacow said in a September interview that the tax will prompt “belt-tightening” across the University, though he does not yet know which areas will see cuts. Amid these fiscal hurdles, Bacow is examining the University’s financials at the macro level. Like a true economist, he’s looking ahead to when the next recession hits. A decade after the 2008 global financial crisis — which decimated Harvard’s endowment and led to years of struggle — the United States economy is now booming. Bacow warned, however, that this will not always be the case, a point he has emphasized in discussions with the University’s top administrative brass. Bacow said he has “challenged” all of Harvard’s schools to engage in “scenario planning” for when the markets inevitably dip. 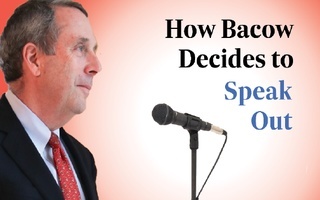 “What are we going to do when we have a recession — not if – I guarantee you there will be a recession, I don’t know when it’s coming, but it’s important to think about it in advance,” Bacow said. As history has shown, colleges and universities — which often depend largely on their endowments for funding — often find themselves in particularly precarious positions when markets take a turn for the worse. When former University President Drew G. Faust moved into her Massachusetts Hall office, one of her first tasks was to combat the serious ramifications of the 2008 financial crisis. Harvard’s then-$37 billion endowment plummeted $11 billion in value after returning negative 27.3 percent — a clear sign the University was in trouble. “Just in a matter of hours you watched the markets crash, and you felt this urgent emergency was going on before your eyes, and you didn't know if by the end of the next day the endowment would have fallen another 10 percent or 15 — when was it going to stop? Was there going to be no endowment left at all?” Faust said. Faust made some critical decisions during her first weeks on the job. She assembled the deans of all of Harvard’s schools to form a dean’s council, whose members then helped her pick and choose where to make cuts in the University’s budgets. Those choices included Faust’s decision to halt the construction of Harvard’s $1 billion science and engineering complex in Allston (now slated to open in summer 2020). 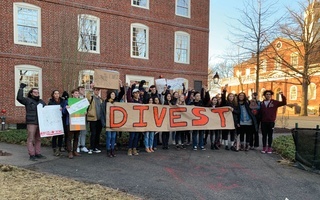 In addition to suspending its Allston plans, the University also reduced Harvard’s staffed food services, froze faculty salaries and hiring, and laid off and offered buyouts to hundreds of University employees. The recession also delayed Harvard’s highly anticipated capital campaign — scheduled to kick off in 2006 or 2007 under former University President Lawrence H. Summers — by several years. The University has yet to fully regain its financial footing. In 2016, Harvard’s endowment lost almost $2 billion, dropping to $35.7 billion and marking its worst endowment returns since the nadir of the 2008 recession. Still, the valuation of the endowment has trended upward in recent years. It returned to its 2008 value in 2017, clocking in at $37.1 billion. Last week, Harvard announced its 2018 endowment returns, revealing that the endowment's value now stands at $39.2 billion — a milestone in the turnaround from former financial woes. These returns, however, still put the University in last place behind all seven of its Ivy League peers in terms of percentage growth. The delayed capital campaign took off in 2013 under Faust’s purview, closing out in September at $9.6 billion and smashing higher education fundraising records in the process. The campaign surpassed its original goal by more than $3 billion. But, as Bacow made clear, the University’s financial health is dependent on the fluctuations of the market — and every boom ultimately busts. Bacow’s foresight regarding the whims of the market finds an echo throughout many of Harvard’s individual schools, whose deans said they are also planning for an impending downturn. Bridget Terry Long, the new dean of the Graduate School of Education, is also an economist by training. In an interview Thursday, she said it is “prudent” to think about “rainy days” when it comes to financial planning. “There is the cyclical nature of the economy,” Long said. She referenced Wednesday’s stock market dip as evidence of current instability. She added that recessions typically occur rughly once every decade. Dean of the Faculty of Arts and Sciences Claudine Gay — another recently appointed University leader — said it is crucial to consider impending market fluctuations when undertaking financial planning for not only FAS, but for the entire University. “In a context like the current one, where most economists are saying that it's very likely there will be a downturn, potentially globally, not just the U.S., in the next five years, it's impossible not to take that into account,” Gay said. During the financial crisis, FAS suffered a $77 million hit to its budget. It was also negatively affected by Harvard's substandard endowment returns, given FAS relies on those returns for about half of its budget. In order to match the buying power FAS had in 2008, Gay said the school’s own endowment would have to increase by $4 billion dollars. 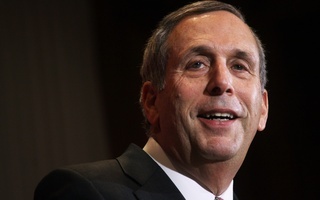 But FAS has made reforms in its fiscal planning since the Great Recession under the tenure of former FAS Dean Michael D. Smith, Gay and Bacow said. 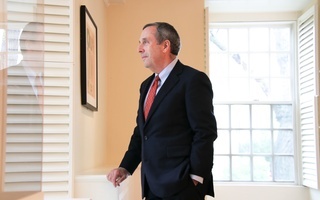 Bacow said Smith helped FAS look for “efficiencies in the budget” and that Harvard's recent capital campaign — which raised $3.2 billion for FAS — has given the school a boost. Gay said the 2008 crisis forced FAS to strengthen its budget strategy in ways it might not have pursued if not for the recession. She added that the school is “actually in a stronger position” due to the “greater discipline” in financial and academic planning. “Dean Smith did tremendous work over the last 11 years in terms of providing, bringing a level of financial discipline to the structure of the FAS and really providing us with a really solid foundation that honestly didn't exist pre-crisis,” Gay said. 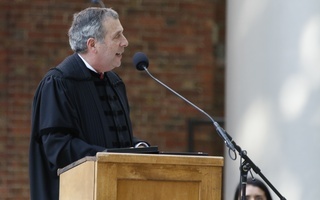 Richard P. Melnick, chief financial officer at Harvard Business School, wrote in an email that Bacow did not introduce “scenario planning” to HBS financial strategy, but that the new president has “underscored the importance” of such a practice. Melnick said he annually asks various units of the school to tell him what they'd do if their budgets shrank by five percent as part of the “downside scenario planning” strategy. In an interview last week, Kennedy School Dean Douglas W. Elmendorf said Bacow has driven home the “importance of developing careful plans." Elmendorf added that, even before Bacow became president, it's been common practice for every school — including HKS — to construct a multi-year financial plan. “When we do the financial plan at the Kennedy School, we've been doing not only the base case but also a downside case that could capture the effects of a future recession or a big decline in the stock market or some other adverse event,” Elmendorf said. “When you have surpluses and you can expand and do things responsibly, but you do have to think about those rainy days. And so for us, for any of our kinds of investments we have, we always have to think about what's the potential benefit of these investments. Can we keep it sustainable?” Long said. “I generally think it's just my upbringing, you know, you don’t spend money you don’t have." —Staff writers Alexandra A. Chaidez, Angela N. Fu, Lainey A. Newman, and Lucy Wang contributed reporting.